Braden Halladay took the mound for Baseball Canada’s U-18 team and Blue Jays’ fans gave him a warmer welcome than most prospects. This is because he is the son of Jays’ legend Roy Halladay, who tragically passed away in a plane crash in November. Braden is a 17-year-old high school student. After the ovation he flashed a bit of his father by tossing a perfect 8th inning, but it wasn’t just the scorecard that looked like one of his old man’s. 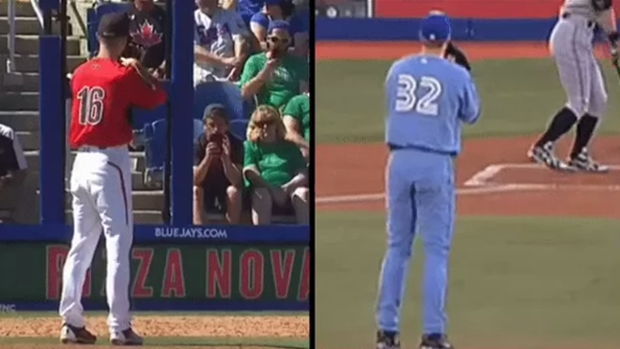 A side-by-side of the two pitchers shows a remarkably similar delivery. Even if you didn’t know his name, Jays’ fans could almost pick him out of a line based on that familiar delivery. Shades of Doc. BREAKING: Toronto Blue Jays legend Roy Halladay has died in a plane crash in the Gulf of Mexico. He was 40.